This package implements a system that uses ceiling mounted fiducial markers (think QR Codes) to allow a robot to identify its location and orientation. It does this by constructing a map of the ceiling fiducials. The position of one fiducial needs to be specified, then a map of the fiducials is built up from observing pairs of markers in the same image. Once the map has been constructed, the robot can identify its location by locating itself relative to one or more ceiling fiducials. Sometimes for trobleshooting purposes it is useful to record a bag file to capture the exact data on the topics going into and out of fiducials. To do this, while the system is running, run rosbag record -a. You can upload this bag file to a file sharing service like Google Drive and link to it in your issue, this will help us diagnose the problem. This package implements a system that uses ceiling mounted fiducials (think QR Codes) to allow a robot to identify its location and orientation. It does this by constructing a map of the ceiling fiducials. Once the map has been constructed, the robot can identify its location by locating itself relative to one or more ceiling fiducials. A more detailed document is available that describes the system in more detail. Software Installation. You will have to install the appropriate software. Mount Ceiling Fiducials. You will need to print and install a number of fiduicals on your ceiling. The fiduicals have to be big enough that your camera can resolve them. Camera Installation. You will need to install and calibrate an upward pointing camera. On Ubiquity Robotics robots this has already been done. The fiducials are typically generated from the laptop/desktop. This will generate tag1700.svg through tag1799.svg. On Ubiquity Robotics robots the camera in already installed and calibrated. For users of other robots, the process is described in an Appendix. The format of this file is id x y z pan tilt roll numObservations. This assumes the fiducial is on the ceiling, and the 180 degree rotations are used so that the pose of fiducials is determined in the co-ordinate system of the floor. Increased accuracy can be gained by specifying the height of the fiducial (z), and that this can also be determined from the output of fiducial_slamp.py. It is important that the transform from base link to the camera frame is correctly specified. The launch files are currently in transition, but at the moment, fiducial_detect/launch/raspi_pose.launch is where this transform is specified. First create an empty map as above. Note that the robot node should be running (so that the transform from odom to base_link is published) and at aleat one of the fiducials that is in the the map should have been observed before rviz can display anything in the map frame. At this point the robot should be capable of executing move_base and other mavigation functions. Red cubes represent fiducials that are currently in view of the camera. Green cubes represent fiducials that are in the map, but not currently in the view of the camera. Blue lines connect pairs of fiducials that have shown up in the camera view at the same time. The map is constructed by combining fiducial pairs. This node finds fiducial markers in images stream and publishes their vertices (corner points) and estimates 3D transforms from the camera to the fiducials. It also has 2D SLAM built in. tag_height Name of the tag_height file (default Tag_Heights.xml). This file is used to specify the height of the fiducials for 2D slam. map_file Name of the file where the generated 2D SLAM-based map should be stored (default ROS_MAP). log_file Name of the log file (default fiducuals.log.txt). data_directory Name of the directory where tag_height and map_file reside, relative to ~/.ros. odom_frame If this is set to a non-empty string, then the result of the localization is published as a correction to odometry. For example, the odometry publishes the tf from map to odom, and this node publishes the tf from odom to base_link, with the tf from map to odom removed. Default: not set. map_frame The name of the map (world) frame. Default map. pose_frame The frame for our tf. Default base_link. publish_images If true, images containing fiducials are published. Default false. publish_interesting_images If true, 'interesting' images containing fiducials are published. Default false. This is for debug purposes. publish_tf If true, transforms are published. Default false. publish_markers If true, visualization markers are published. Default false. estimate_pose If true, 3D pose estimation is performed and fiducial transforms are published. Default true. fiducial_len The length of one side of a fiducial in meters, used by the pose estimation. Default 0.146.
undistort_points If false, it is assumed that the input is an undistorted image, and the vertices are used directly to calculate the fiducial transform. If it is true, then the vertices are undistorted first. This is faster, but less accurate. Default false. fiducials_are_level If true, it is assumed that all fiducials are level, as would be the case on ceiling mounted fiducials. In this case only 3DOF are estimated. Default true. 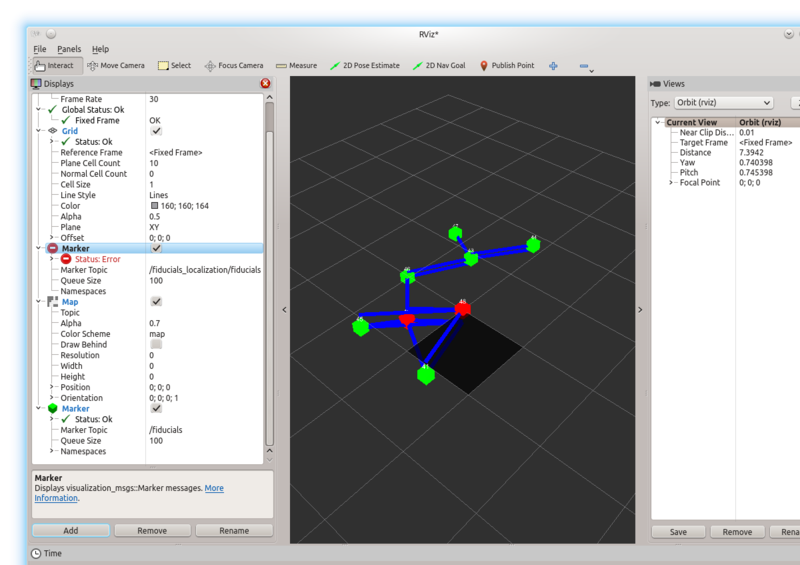 fiducuals A topic of visualization_msgs/Marker messages that can be viewed in rviz for debugging, if that option is selected. vertices A topic of fiducial_detect/Fiducial* messages with the detected fiducial vertices. fiducials_images An ImageTransport* of images containing fiducials, if that option is selected. interesting_images ImageTransport* of interesting images, if that option is selected. fiducial_transforms A topic of fiducial_pose/FiducialTransform messages with the computed fiducial pose. camera An ImageTransport of the images to be processed. camera_info A topic of sensor_msgs/CameraInfo messages with the camera intrinsic parameters. This node performs 3D Simultaneous Localization and Mapping (SLAM) from the fiducial transforms. For the mapping part, pairs of transforms are combined to determine the position of fiducials based on existing observations. For the localization part, fiducial transforms are combined with fiducial poses to estimate the camera pose (and hence the robot pose). map_file Path to the file containing the generated map (this must exist). Default map.txt. trans_file Path to a file to store all detected fidicial transforms. Default trans.txt. obs_file Path to a file to store all detected fidicial observations. Default obs.txt. camera_frame The name of the camera frame. Default camera. publish_tf If true, transforms are published. Default true. republish_tf If true, transforms are republished until a new pose is calculated. Default true. mapping_mode If true the map updated and saved more frequently. use_external_pose If true then the node will attempt to use an external estimate of the robot pose (eg from AMCL) to estimate the pose of fiducials if no known fiducials are observed. future Amount of time (in seconds) to future-date published transforms. Default 0.0.
fiducuals A topic of visualization_msgs/Marker messages that can be viewed in rviz for debugging. fidicual_pose a topic of geometry_msgs/PoseWithCovarianceStamped containing the computed pose. fiducial_transforms A topic of fiducial_pose/FiducialTransform messages with fiducial pose. This node will reinitialize amcl by republishing the pose reported from fiducial_slamp.py to amcl as an initial pose. cov_thresh The threshold of covariance reported in amcl_pose for reinitializing it. Default 0.2.
amcl_pose (geometry_msgs/PoseWithCovarianceStamped) The pose from AMCL. The covariance of this is examined to determine if AMCL needs re-initializing. If you are not using a Ubiquity Robotics robot, you will need to install a camera and hook it into ROS. The Raspberry Pi 2 Model B is a 900MHz quad core ARM7 single board computer with 1GB or RAM. It has a variety of connectors including a CSI MIPI camera connector for their Rapsberry Pi Camera which has some nice specifications. The Monocular Camera Calibration tutorial shows how to calibrate a single camera. The 8x6 checkerboard and the 7x6 checkerboard are rather large and require specialized printers to print out at full scale. They can be printed on more common printer sizes with auto scaling turned on. Be sure to carefully measure the square size in millimeters and convert to meters by dividing by 1000. # probably does not exist. The resulting error is OK.
Read the Monocular Calibration tutorial. When the calibrator comes up, the [Calibrate], [Save], and [Commit] buttons are dimmed out. After the [Calibrate] button shows up, click on it once. After the [Save] and [Commit] buttons show up, click on the [Save] button once. Do not waste your time clicking on [Commit], that feature is not supported by gscam. Now you get to convert the file ost.ini to a .yaml file. After this step, when you run the camera, you should no longer get the calibration file error.